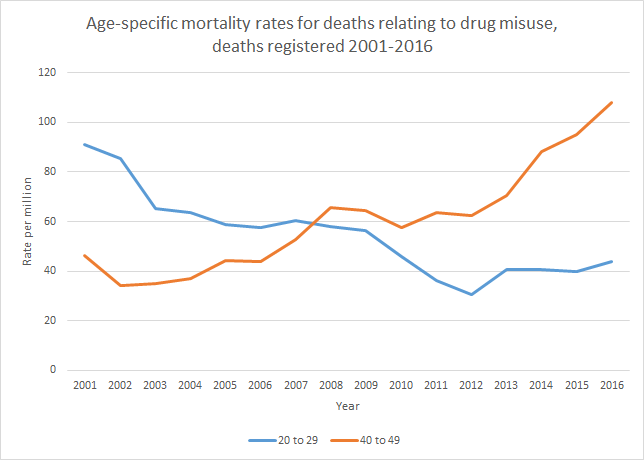 The overall rise in drug-related deaths reported in the most recent figures from ONS, published yesterday (2 August 2017), masks dramatic discrepancies between age groups. Deaths among the under 30s have fallen significantly, with those concerning people in their 20s more than halving over the past 15 years. More than anything else, this reflects the fact that this generation is much less likely than its predecessors to use heroin and other opiates which remain the most dangerous drugs and the single biggest driver of overdose deaths. The contrast with those in their 40s who came to adulthood at the height of the heroin epidemic could not be starker. Deaths in this group have doubled during the same period, driven as PHE has pointed out by the increasing fragility of a cohort characterised not just by decades of heroin use, but just as importantly by homelessness, poor mental health, alcohol misuse and smoking. The single most effective thing we can do to minimise deaths is engage as many of this population as possible in treatment. Unfortunately this is proving increasingly difficult as hard-pressed local authorities reduce the resources they allocate to drug treatment. The Drug Strategy published last month announced that from now on, the Home Secretary will personally lead cross-government efforts to reduce drug-related harm; ensuring adequate funding to prevent deaths needs to be the first thing on her agenda. While I wholeheartedly agree that we need to engage more people in treatment, as a preventative factor in DRDs the evidence is that it is OST that is effective. Leaving abstenance based treatment with a low tolerance is a risk factor. I don’t mean to engage in any silly simplistic harm reduction v recovery debate, as I believe both are important and not mutually exclusive. Deaths while in treatment and more importantly when dropping out or leaving treatment is an area that I would like to see you acknowledged as I find your comments come across as simply asking for more money for treatment services as if that in itself will solve the problem. I would have like to see a mention of naloxone a widening of naloxone provision was announced on the same day as the ONS figures and this is probably the most effective single thing we can do. So unless continued investment in services, more people will die. Govn and LA are choosing the consequences of disinvestment, as they do across all areas of social care and public health.. It is the poorest who suffer from the withdrawal of support in healthcare and social care. I was one of the 40+ year olds, with 20 years of addiction, who was very close to been a opiate death, but thankfully I engaged with CRI at the time and went to rehab with their help, I’m a big believer in getting users in treatment and trying to get them to engage in treatment, I just hope the government puts their money where their mouth is, or the rise in deaths will increase, in the past 2 years I’ve seen 10 deaths who I new personally from my past, all in the 40s.